I’m not sure how much longer the two of us can fit into this wicker chair together, but for now we fit just fine—snug, but fine. She’s a willowy thing, long legs, hair flying in her face, serious one minute, pure goofball the next. We are on the porch leafing through the Sibley Backyard Birding cards. “Did you know a swift can sleep when it flies?” she says. Amazing is that she looked a whole lot like a baby bird herself when she was born, just over 3 pounds. Now here she is sitting strong and healthy, neurons firing, feet swinging, talking about birds, bicycles without training wheels and cartwheels. “Amazing,” I say. It really is. 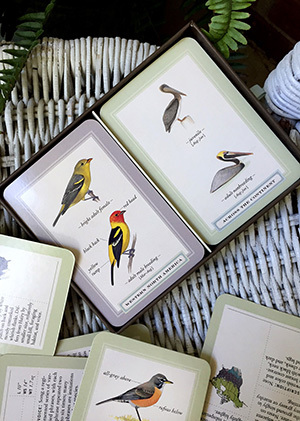 She giggles, leafing through the bird cards lickety-split. The stack is in disarray and cards are tumbling in every direction. This is exactly how she’s growing—with amazing speed, with life and learning cascading in every direction. Oh, I hear. I heard when she cried nearly nonstop the first six months of life, when she babbled first words and now as she chatters nonstop about her new shoes, trips to the library and how she’s stuffy from allergies. A robin swoops over to the crabapple tree and perches on a branch. “He’s talking to your phone!” she squeals. She is beyond delighted and I am delighted that she is delighted, knowing that these moments will pass us both by all too quickly. The robin swoops down to the lawn. She watches him intently, wondering what he might find and speculating that he probably has a nest nearby. The robin hops around, pecks a couple of times and pulls out a fat, juicy worm. He tilts his head as if to show us his catch. And then he takes off. “Look at him fly,” she says. I’m looking. Believe me, I’m looking.